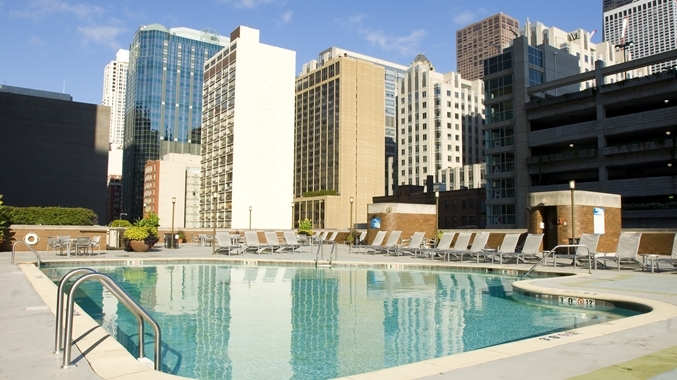 Located at the top of the Doubletree Chicago Magnificent Mile the rooftop pool offers panoramic skyline views of Chicago and Lake Michigan. The pool features a variety of deck furniture, sculpted topiary, and a poolside snack bar known as H2O. H2O serves a wide variety of alcoholic and non alcoholic beverages as well as light snacks. The rooftop pool is seasonal, and day passes are available. The pool is open from Open from 8 a.m. – 10 p.m. daily.